The passage from John's Gospel today is one which causes some consternation. Jesus makes wine, lots of it, more than anybody needed. It is over the top and could easily be criticised as wasteful. Is that what God is like? Well the ministry of Jesus does show us what God is like, he is God in human form, and this incident is one of those extravagant moments when Jesus gives us a glimpse of the nature of God's provision for us. The miracle tells us much. Perhaps it shows just how different the way things are going to be with Jesus when compared to the Old Testament. The Law was given for the nation of Israel and it was bad news for everybody else. God has shown grace and mercy to individuals like Abraham, but the God the Jews worshipped was a terrifying figure who demanded that innocent animals be sacrificed to atone for the sins of people. It was gruesome stuff and even then it was only these special people, the Jews who enjoyed God's covenant relationship. So perhaps Jesus needed a really extravagant miracle, to show everybody that things had changed. Now the love of God was to extend to all people, he would go to the gentiles too, and there was enough grace and mercy to go round, enough for everybody - just like the wine. I like wine and I enjoy going to wine tasting where people who are experts describe why certain wines taste the way they do and how they were created. I was encouraged to sample a sherry before Christmas that was made from 30 year old raisins. The taste was extraordinary, like liquid Christmas pudding. Of course the main ingredient of wine is water. The fabulous wine makers have perfected their skills over thousands of years but fundamentally the main ingredient of wine is water. The individual vineyards on particular sloping hills, the soil the 'teroir' is all important but at the heart lies water. Wine is something of a miracle, God gives us seeds and sun and water and things grow. However you need to have a certain sense to notice, otherwise it is just wine that we have made. For many people at the wedding it appears that the miracle went unnoticed. The enjoyed the wine of course but they remained unaware of the miracle which gave it. In other words they took it for granted. The miracle was an amazing glimpse into Jesus and his ministry. It spoke of abundance and it illustrated change. These were to be two very important parts of the ministry of Jesus. He showed that God’s grace mercy and forgiveness were extravagant, showered on all people. They also offered to those who would accept it the opportunity for change, there was no need for anybody to be satisfied with anything less than knowing the amazing power of God in their lives. The traditional date for the Week of Prayer for Christian Unity is 18-25 January. Those dates were proposed in 1908 by Paul Wattson to cover the octave (8 days) between the feast of the Chair of St Peter at Rome and the feast of the conversion of St Paul. In the southern hemisphere where January is a vacation time churches often find other days to celebrate the week of prayer, for example around Pentecost (which was suggested by the Faith and Order movement in 1926), which is also a symbolic date for the unity of the church. But the search for Christian unity is not limited to one week each year. We are therefore encouraged to see this as an invitation to find opportunities throughout the whole year to express the degree of communion which the churches have already received, and to pray together for that full unity which is Christ’s will. The search for peace in the Middle East will be the backdrop for this year's celebration of the Week of Prayer for Christian Unity, from Jan. 18-25. "As peace in our world remains elusive and is obstructed at every turn, the search for peace, and the profound hopes which are entwined in that search, form a vital part of the prayer which rises from our hearts to the merciful heart of God in our day," said the international joint committee of the World Council of Churches (WCC) Faith and Order Commission and the Pontifical Commission for the Promotion of Christian Unity. The theme has been drawn from John 14:27, "My peace I give to you / Ma paix je vous donne." The Christian churches of the city of Aleppo, Syria, proposed the theme for this year's ecumenical worship services. The celebration is modelled after services regularly used in the Orthodox, Catholic, and Protestant churches of Aleppo. The yearning for peace around the world is certainly palpable. Praying for peace is important because some people have given up hope of ever achieving it. It is difficult because while we continue to pray for peace it's hard to see that we're getting anywhere. Many of us have taken part in these Weeks of Prayer for Christen Unity for the whole of our adult lives and the inevitable questions arises - What good do they do? Where is the unity we have prayed for? Judging from the evidence of disunity among Christians, even within churches and denominations, we can go on to ask: Does God not hear our prayers? If the answer is “yes!” then maybe we are not listening to what God is asking of us! Surely this is not how Jesus meant it to be. St Paul makes quite clear the unity to which Jesus calls us. There are still many conflicts around the world and so, people really struggle. There are those who say 'why bother?' however we must not loose hope but continue praying for peace. We have to keep the search for peace at the forefront of the life of the world wide church. Christians are urged to pray and work for peace, not only during the Week of Prayer for Christian Unity, but throughout the whole year. As Christians pray for peace we should also pray and work for the unity of the Church. We cannot honestly pray for peace in the world and rest content with all the divisions and dissensions in our own lives as Christians. As the rainbow is a sign of God’s peace so it is also a sign of the Christian unity for which we pray. It is not uniformity which we seek, but a unity which holds together our diversity, a unity which is made more beautiful by our diverse colours, as the one rainbow holds together the colours of the spectrum in a beautiful whole. 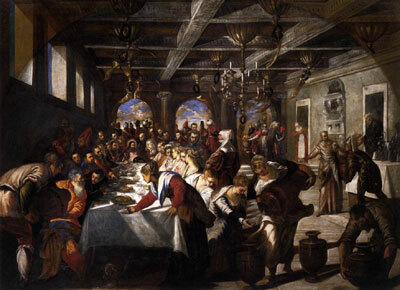 This painting by the great Venetian master painter Tintoretto shows the wedding feast at Cana. This is a huge canvass oil painting 4.35m x 5.45 m which dominates a wall where it was commissioned and is still in situ in the Sacristy of the Chiesa di Santa Maria della Salute, Venice. The painting shows the first miracle at Cana at a wedding at the start of the ministry of Jesus. Tintoretto transposes the scene to 16th-century Venice and shows interesting details of everyday life, customs, and fashion. In his ministry Jesus will be seen at many parties eating and drinking wine, resulting in many calling him a ‘glutton and a drunkard’ (Matt 11:19). This prefigures the teachings of Jesus that beyond this earthly life his followers will enjoy a heavenly banquet and it is seen as a precursor of the Eucharist. On the table you can see empty glasses and decanters, the guests have clearly been enjoying themselves and there is more food needing to be washed down with wine. The perspective of the table draws the eye towards the end of the table where Jesus is seated and his head is surrounded by light. Next to Jesus there is a woman to his left, this is clearly Mary his mother who has encouraged Jesus to intercede and do something to help out and provide more wine for the guests enjoyment. The women on the right side of the picture are seen pouring water into the large jars. This moment is just before this first miracle in John’s Gospel takes place. The other guests are oblivious to what is going on as they wait for more wine to be brought. When the jars are subsequently poured they will still remain clueless about what has happened and simply remark that the host has reversed expectation serving the best wine second, instead of first. Usually the poorer quality wine was served when the guests had drunk too much to notice. Miracles can be like this, only seen by those with eyes of faith. In the synoptic gospels, (Matthew, Mark and Luke) Jesus performs what are called miracles. In John’s Gospel John does not call them miracles, he calls them signs. We are told in John 20 what the purpose of the Gospel was - he wrote Now Jesus did many other signs in the presence of his disciples, which are not written in this book. But these are written so that you may come to believe that Jesus is the Messiah, the Son of God, and that through believing you may have life in his name. Note ! Jesus performs signs, not miracles. And the reason why these signs took place was in order for people to believe in who Jesus was. John is quite restrictive in how many of these signs he records. There are only seven in the whole Gospel. He has slimmed down the miracles and chosen seven special ones which he thinks are significant signs in demonstrating who Jesus was and what he was doing. Why was Jesus there? Jesus is invited with his disciples and we know that at this stage there were probably at least five: Andrew, Simon Peter, Philip, Nathanael and the anonymous disciple (1:35). The mother of Jesus is also invited. We don't know why Jesus was invited. Mary perhaps knew the family because she is concerned about the wine and seems to be able to give instruction to the catering staff. Note - in John's Gospel Mary is only mentioned twice, once here and the next time is at the cross when Jesus hands her into the care of the disciple. Curiously she is never actually called Mary. We know that one of the disciples of Jesus, Nathanael, came from Cana, he would have probably known the couple who were getting married. It was on the Third Day A wedding was a big occasion in that time. We are told that it took place on the ‘Third Day.’ We have weddings on Saturdays, at that time in ancient Israel Tuesday was the wedding day! In the UK right now I am told that Sunday is the most popular day for Jewish weddings to be held.There is some thought that at the time Tuesday was considered a good day because in the Torah story of creation Tuesday is the only day that God describes as ‘good’ twice. (see Genesis 1:10 and Genesis 1:12). The significance of Third Day can hardly be missed, Jesus was raised on the third day. It went on for seven days Wedding ceremonies normally lasted seven days. Depending on the wealth of the family a whole town could be invited and many rabbis excused the celebrations from the conflicting religious obligations. Even people you didn’t get on with would be invited and it was insulting to refuse to attend. The ceremonies were not just about two people getting together, it was the bringing together of families. There could be no quick trip to a wedding chapel in Jerusalem! Wine was important The host was supposed to provide wine for all for seven days ! Running out of wine was a major faux pas. It was not just a blunder, in a culture which was very much based around shame and honour, it was something which would bring shame on not just the couple but the whole family. Wine was a fundamental part of the celebrations and to run out was not just inconvenient it was a loss of reputation, a damaging social situation would cause a loss of honour and status. Mary told Jesus they ran out of wine Much has been written about how Mary asks Jesus to help out, and how Jesus responds. Most of it is just guesswork and we will never understand fully understand. On the face of it Jesus seems reluctant to intervene. He uses the words ‘my hour has not yet come.’ The word ‘hour’ in John’s Gospel is a term which is used by Jesus to refer to his death. I have included the references here which you may wish to use in your own Bible study. :4:21, 23, 5:25, 28, 7:30, 8:20, 12:23, 27, 13:1, 16:2,4, 21, 25, 32, 17:1). Then they tried to arrest him, but no one laid hands on him, because his hour had not yet come. He spoke these words while he was teaching in the treasury of the temple, but no one arrested him, because his hour had not yet come. Now my soul is troubled. And what should I say—“Father, save me from this hour”? No, it is for this reason that I have come to this hour. These passages put the question of Mary and the response of Jesus into a context which is so much more than just helping out at a wedding. This was about understanding who he was and what he had be born to do, his obedience to the mission which God had given to him. Jesus turns water into wine It is a fantastic miracle. The Jewish traditions demanded that Jews were not to eat until they gave their hands a ceremonial handwashing. Do you remember Mark 7:3-4. Now when the Pharisees and some of the scribes who had come from Jerusalem gathered around him, they noticed that some of his disciples were eating with defiled hands, that is, without washing them. (For the Pharisees, and all the Jews, do not eat unless they thoroughly wash their hands, thus observing the tradition of the elders; and they do not eat anything from the market unless they wash it; and there are also. So water had to be poured by servants over the hands of every guest before the meal. The more guests the more jars ! For the purpose of water purification there were six hug stone jars at this wedding about 150 gallons in total. Jesus gives instruction for the jars to be filled and for the content to then be taken to the chap in charge of the ceremony who announces that the best wine has been kept until then end of the festivities. So what was the sign - it wasn’t just water Everybody remembers that Jesus turned water into wine. But of course it wasn’t just water. If Jesus turns water into wine it is a great trick, but it isn't the sign! It becomes a poingnant sign because this was special water, it was water of purification, it was Jewish cleaning water. Jesus takes Jewish cleaning water and shows he has the power to change it. It becomes a sign, an illustration of the fact that the old water of cleaning was now being superseded. You had ceremonial water which people had to use over and over again but they were never really clean. Jesus is saying that this system didn’t work and so Jesus puts an end to ceremonial washing ! The law constantly reminded you how dirty you were. Jesus has come so that you can be properly clean. The reason why this miracle is the first miracle, the reason why it is so important, is because in it Jesus is doing nothing less than redefining our relationship to God. Instead of repeatedly washing but never being clean, now all would be made clean by Jesus. ‘Destroy this temple, and in three days I will raise it up.’ 20 The Jews then said, ‘This temple has been under construction for forty-six years, and will you raise it up in three days?’ 21 But he was speaking of the temple of his body. 22 After he was raised from the dead, his disciples remembered that he had said this; and they believed the scripture and the word that Jesus had spoken. Conclusion Being a follower of Jesus is like being invited to a wedding where the wine does not run out. That sounds like it is a happy place and Christians should be filled with Joy, Jesus was not into making people miserable. You can get that out of the passage today with no problem. But the sign says something else which is very important. The question used to be whether you could become clean enough to come near to God and some people still think in that way. 'I am not good enough', 'I am insignificant and God wouldn't be bothered with me.' Jesus is not interested in how good we are, all are invited. No matter how dirty, you are Jesus makes you clean. The communion which we celebrate today is Jesus meal and he invites everybody. There is nobody too dirty, nobody who is not good enough, all are called to come. There are no barriers to the love of God, so all are invited to come. Children, women, men, all are invited to come. Jesus said it was no longer about how clean how religious you are, it is just about whether you will come. Jesus says ‘come to the table.’ He invited everybody to come to him and he still does, and that is why the Cana sign laid down the new rules and why it was so important . The Cana sign shows that Jesus is God’s expression of the turning over of the old religion of barriers and his offering of himself for to show his overflowing love and forgiveness. Now all that we need to do is come. In Psalm 40:8 we are told that God invites us to take pleasure in our work for him. Here, in the gospel reading set for today, from St John’s gospel, we learn that Jesus was enjoying being at a wedding celebration, when he performed his first miracle. It seems quite likely that Jesus had not gone to the party with the intention of performing a miracle, but was virtually forced into it by the actions of Mary, his mother. Clearly she had merely intended getting Jesus to help the people organising the party out of an embarrassing situation, while the miracle which Jesus performed wac a great work – turning about 180 gallons of water into good quality wine is no mean feat! If this miracle had taken place at a point other than at the start of Jesus’ ministry, then I am pretty certain that we would have heard Judas carping about people simply drinking the wine. No doubt he would have said something to the effect of: ‘What a waste! This wine could have been sold and the money given to the poor!’ (cf John 12: 4-6). Yes, I suppose, the drinking of such good wine after people had drunk plenty already, probably was a waste in that sense. However, the wine served a two-fold process: at one level it gave pleasure to all the wedding guests as they celebrated the marriage of the couple, whilst at a deeper level it made everyone aware of the generosity of God in providing a first class product: no second rate home brew from that source! We could possibly go further and say that through it God was also recognising the importance to him of the marriage ceremony and the vows made. If we think about our own experiences, then do we give as freely as God gave here? God gave freely and readily more than perhaps was needed. Do we give as generously of our time and talents in the service of God? Or do we begrudge the time which we spend in worship, prayer or helping others? Do we calculate how much we can afford to give to mission funds, or the work of the Church whether it be at home or abroad? If we look at Matthew’s gospel (6:31 – 35) then what we find is that if we put God’s work first, then God will take care of everything else. All it takes is a giant step of trust, and such a step will be a big one because it goes against everything we have been taught. After all, the world we live in is one which emphasises insurance schemes, pension funds, and long term planning for the future. There are not too many of these ideas emphasised in the Bible! Soul of Christ sanctify me. Body of Christ save me. Blood of Christ inebriate me. Water from the side of Christ wash me. Passion of Christ strengthen me. O good Jesu hear me. Within thy wounds hide me. Suffer me not to be separated from thee. From the malicious enemy defend me. In the hour of my death call me and bid me come to thee. That with thy saints I may praise thee for ever and ever. Amen.